When a large, repeat client needed quick action on a project, they had the confidence to call on us. 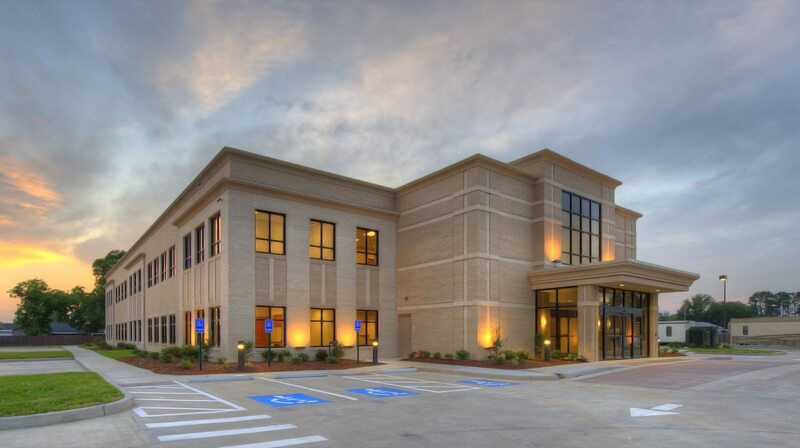 The task was to design a new two-story 40,000 sf medical office building (MOB) on an existing hospital campus. The challenge was to design the MOB in just 90 days (due to a federal tax incentive resulting from the project’s geographic location), a time period that started with that first phone call from the client in July 2009. The challenge was also to include the design and buildout of eight separate interior office suites. Ultimately, the strong existing relationship between owner, contractor, and architect allowed this project to move forward both aggressively and smoothly. The total project schedule from the first phone conversation to substantial completion was just under 10 months. The building was designed with an all-brick façade to compliment the material and color palette of the existing hospital building that is located directly across the street from the MOB. One of the main aesthetic goals was to use brick to “break-up” the required rectangular building footprint. As a result, we incorporated brick pilasters to anchor the front and rear façades. Smaller brick pilasters were then used to frame the storefront entry vestibule, which addresses the street front as well as serving as a “connector” to the hospital entrance across the street. We carefully designed both recessed and projecting brick courses to provide the building façade with subtle, clean lines as well as depth.